Whats going into your Smoothies? Smoothies can be incredible concoctions of nutrients, energy and superfoods. They can provide an easy to prepare, portable, health supportive meal. Smoothies can also be complete sugar bombs that spike our blood sugar and wreak havoc on our digestive systems! Lets keep it simple, if you can remember to add and always include the four main components that I will explain and provide examples for below, then you will have a well balanced smoothie - appropriate for a meal replacement, that will keep you going for hours and not spike your blood sugar! * Fats keep blood sugar stabilized, they slow down the rate glucose and fructose sugars are absorbed. Fats provide longer term energy! They will not make you fat, they are so essential for hormones and so much more! 2. Fibre: all the above in the fat category include fibre with the exception of oils..
3. Protein: If you have nut butters and seeds in your smoothie, this will provide some protein. - Adding a plant based protein powder such as hemp seed powder, brown rice protein or a blend of vegan proteins or collagen powder can top it up! If you tolerate dairy, whey protein from a quality grass fed source can also make up your protein. 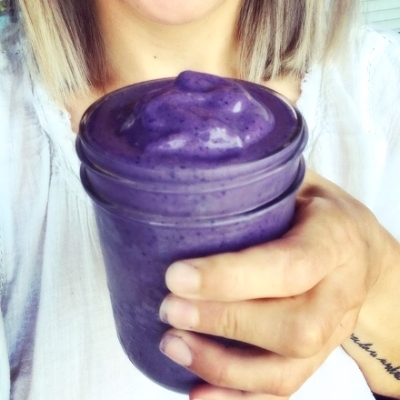 A little extra protein is recommended if you are using the smoothie as a meal replacement, for breakfast or to make up protein intake in a plant based diet. 20-30 grams of protein in one meal is sufficient. 4. Greens: Throw in some greens and veggies, you can add a lot without changing the taste much, you'll be adding more fibre and tons of phytonutrients. Examples: any baby greens such as baby spinach, chopped kale leaves, swiss chard, nettle, romaine lettuce, or previously steamed and frozen cauliflower, squash such as pumpkin, zucchini, butternut squash, yams, beets, or raw cucumber. If you don't have veggies on hand a greens powder may be a good idea for you. You can also keep a powder around for times when produce stalks are low. I don't always add greens and veggies to smoothies - If I know I will be having a big green salad for lunch, and some roasted broccoli with dinner etc, then I might skip. But if you tend to not meet your veggie quota adding greens to your smoothie is an easy way to get more into your diet and is highly recommended! Note if using a protein powder flavoured as Vanilla or Chocolate that is sweetened with stevia - this creates a flavour much stronger than the Veggies, so may allow you to add more without reducing the taste. Liquids: to blend your smoothies - use water, unsweetened nut milk, coconut milk, or coconut water. Using coconut water is a good idea if you have or will be sweating a lot and need the potassium/electrolytes. Fat is satiating, it provides slowly released energy, slows down the rate of glucose and fructose absorbed in the blood, provides brain fuel, longer term energy store as it is the slowest digesting macro nutrient, fat is essential for hormone regulation and joint health, providing anti-inflammatory fatty acids! - Good fats are essential and do not make you fat! Note if you consume 2 or more servings of animal based proteins daily, adding protein powders may not be necessary - our bodies can only use so much protein, it is true that we need more protein if heavily exercising but the additional amount is often over estimated. Too much protein causes an overly positive nitrogen balance and too much ammonia that cannot be converted to uric acid, this causes a lot of stress on our kidneys, our digestive system and liver! It creates a very acidic environment, dehydration and actually accelerates aging! Greens provide essential fibre, vitamins and minerals including calcium, magnesium, iron, provides phytonutrients, antioxidants to negate free radical damage and stress. Greens are alkalinizing without them we become very acidic. Alkaline greens are needed to balance out the acidity in the rest of the diet from any proteins, meat, dairy or grains we consume..
A lot of fruit and dates blended with fruit juice without much else - this will have your blood sugar sky rocket because all of these ingredients contain heaps of sugars! But isn't fruit good for me? Absolutely! Eating fruit and dates provides some great micro nutrients and fibre, but there is a limit! Choose 1-2 servings of fruit for your smoothie or a few dates and that is sufficient. Too much sugar, even these natural sugars can feed yeast in our gut, contribute to digestive inflammation and blood sugar imbalances. Consuming a lot of sugar will likely leave you hungry once your blood sugar drops again and more likely to over eat and constantly crave more sugar! Relying predominantly on sugars and carbohydrates leads to higher levels of free radicals, which are produced when glucose is broken down to make energy. More free radicals = more cellular damage and inflammation. This does not support longevity! Breaking down fats for energy does not have the same cellular damaging effect. Lastly but very importantly - DIGESTION IS EVERYTHING! If you don't digest your food well, you aren't absorbing all the nutrients you have went out of your way to put in your smoothie, so focusing on complete digestion should be step one! Consuming a lot of smoothies can cause some trouble here especially for those who chug them down while working, and go on with their busy day. * Chewing starts the process of digestion, it signals the enzymes to be secreted that are necessary to break down carbohydrates. Unfortunately, we don't chew smoothies. Adding ice makes extremely cold/icy smoothies which requires more cellular energy to warm us back up, this also takes energy away from the processes of digestion and dilutes our digestive enzymes. Eating/ drinking a smoothie on the run does not allow our bodies to tap into our Parasympathetic Nervous System which allows for rest and digest mode. If we are constantly in (fight or flight) stimulating our Sympathetic Nervous System when we eat - we are not allowing our bodies to digest - break down and absorb nutrients! Make your smoothies thicker (smoothie bowl) and eat them slowly with a spoon, even chew them! If you must drink your smoothies - pace yourself, skip the straw! and skip the ice! Keep it simple and stick to 1-2 from each category as a guide! Including these 4 components can also be applied to all meals when possible, It really isn't too complicated but should help you to have a balanced satiating meal! MORE ingredients if you like extra options.. There are endless super foods and ingredients you could add to your blender. Don't go crazy, if theres a specific reason for x powder keep doing it but you don't have to go nuts. Stick to the four basics and you're covered. If you have a nutrient deficiency, or other concern take the opportunity to add something else you need to support your imbalance. Collagen keeps our skin, nails, hair, and other connective tissues strong and healthy! Including repairing the tissues within our gut lining after periods of stress and inflammation such as leaky gut and allergies. Traditionally we would consume the whole animal when we would eat meat or fish, including the collagen within the bones that steeps out into home made broth. In North America this not a practice in most house holds, even those who consume meat often are consuming lean skinless chicken and fish without the bones and missing out on the collagen! If your diet does not provide much collagen and you are dealing with gut inflammation, skin inflammation or weak nails and hair - collagen supplementation may be a good addition to your diet. I could go on, Acai powder, Moringa Powder, Bee Pollen etc.... Nature and Plants are so amazing! But I have to end this post somewhere.